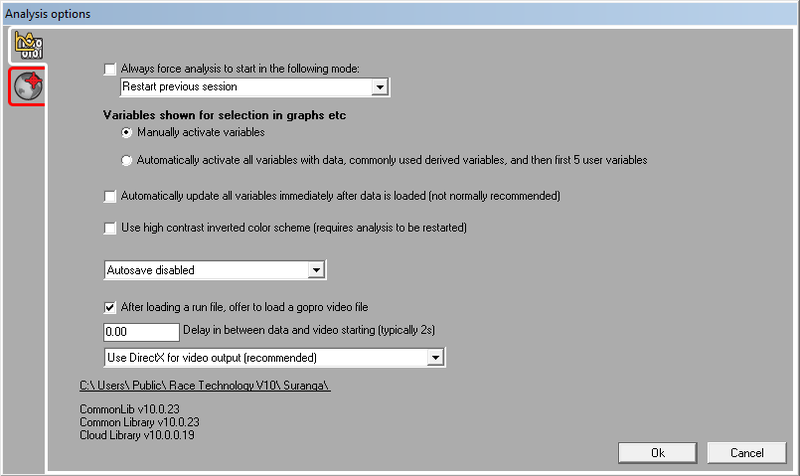 The top setting controls the start up mode of the analysis software. If the option is unticked then when you start analysis you are given the option of the start up mode. If this box is ticked then you can skip this option and force the software to start in a particular mode. Dark theme for analysis software. The next dropdown controls the Autosave, which causes the software to automatically save everything at the specified interval. In the case of the software unexpectedly shutting down, then next time the software is restarted the user will be given the option of loading this backup file. These settings are video related options. The first option controls whether, when a run file is loaded, the software should automatically prompt the user to load a GoPro video file. There is more information about this option here. Then there is the option for selecting the video driver. Note that correct selection of the video driver is essential for the correct, reliable, and efficient operation of the software � but it�s very difficult to suggest which video mode is going to work best on a particular system. Generally most modes will work, but as to which is the �best� will require experimentation. At the bottom of this tab is some technical information about the video configuration, which maybe given to the engineers at RT for diagnosing issues.